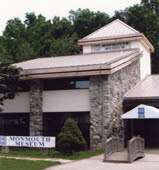 This is a short video of the planning for my show of the Mobiles at the Nilson Gallery of the Monmouth Museum next May 30 to June 29, 2008. The subject of this painting is the reflection of fishing boats at a warf in San Francisco. Giclee prints of my watercolor "Reflections" are now available. It is printed on 22x30" Arches 140 lb. watercolor paper. The image size is 24 1/4 x 18". Price - $300 + shipping.